We as Christians love the cross and we appreciate the role it played when Our Lord Jesus won our salvation by dying for our sins upon it and by His resurrection. However, to love the cross and its meaning in completeness, we must truly embrace it by following the command of Jesus when he says, “If you would be my disciples, take up your cross and follow me”. Truly embracing the cross means we also must embrace our sufferings and hardships, just as our Lord Jesus did for each and every one of us. This has to go hand in hand with appreciating the salvation that Jesus won for us by his death upon the cross for our sakes, it is no good if we do not embrace all our sufferings also. 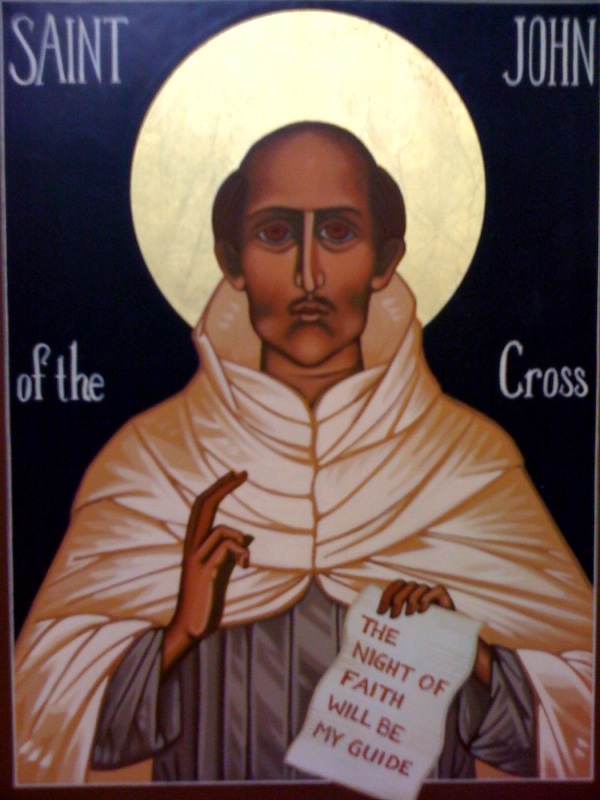 Today, we the Church, commemorate a man who did indeed truly love the cross, even to the extent that it became part of his name, that of St John of the Cross. Although John’s father was from a wealthy noble family, he was disowned for marrying a poor peasant woman, and therefore John was born and raised in the sufferings of poverty. After first working as an orderly to the poor sick at a hospital because he couldn’t get an apprenticeship for a trade, John joined the Carmelite order as a simple brother Friar, but his superiors noticed his intelligence and sent him for advanced study before later ordaining him to the priesthood. John who had much zeal for Apostolic counsel, became discouraged because many of his community failed to share his zeal, and he was about to leave to join the strict hermit order of the Carthusians when he met St Teresa of Avila, who was reforming the Carmelite nuns for the same issue as John had been experiencing. Teresa convinced John to stay and reform the Carmelite friars and John threw himself into these reforms. Although John had the support of his General superior, many of the friars resisted John’s reform efforts and persecuted him. John suffered being falsely accused of wrong teaching and he was imprisoned for nine months. He was blindfolded and led in the coldness of midwinter by very rough mountainous roads to prison in Toledo. He was imprisoned in forced seclusion in a little cell, scarcely six feet by ten, which was originally intended to be a closet and with the only little light being refracted from a tiny window located high on the wall. John suffered forced incarceration, isolation, forced fasting and discipline without even the simple comforts of a book or any writing materials. John suffered all these many hardships and he embraced each and every one of them with such a profound love. He saw them as being his cross that he had to take up to truly follow Jesus. Although St John leaves us the fruit of his spiritual writings, “The Dark Night of the Soul,” “The Ascent of Mount Carmel,” and “The Spiritual Canticle,” by far the most important of all is that he leaves us his wonderful and beautiful witness of one who did indeed truly love and fully embrace the cross. What an example to us all St John of the Cross truly is!! May the life and the witness of St John of the Cross, together with his intercession, help us to fully embrace and to take up our crosses, loving the cross as St John did and as we all truly ought to do. Another great biography, Lady! Thank you for your research and your insights.